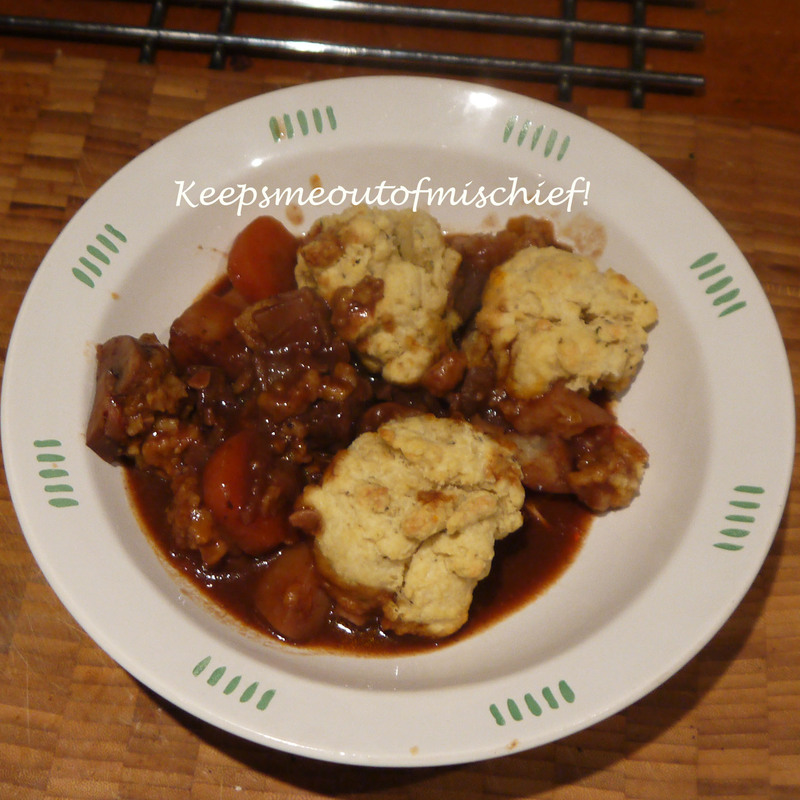 Beef Casserole with Herby Cheese Dumplings | Keeps Me Out Of Mischief! With the temperature hovering around 0°C and a blanket of snow as far as the eye can see a winter warmer is definitely in order. This was made from store cupboard ingredients so I didn’t even have to venture beyond the front door. This quantity made enough for two hearty portions and a couple of baby portions that I’ve whizzed up using the stick blender and frozen for days when we’re out and about – my little boy loves his food (almost as much as his daddy does!). I made double the quantity and froze half after I’d cooked it so I’ve got an easy dish for another night. 200g stewing steak, 1 large potato, 1 carrot, 1 parsnip, 1 onion, 1 clove of garlic, 2 large glasses of red wine, 1 beef stock cube, tomato puree, 150g self-raising flour, 75g butter, 50g grated mature cheddar cheese, salt, pepper, whatever herbs you have to hand. Preheat the oven to 170°C. In a large pan gently fry off the chopped onion and chopped garlic until lightly browned. Chop the meat into large cubes and add to the pan. Peel and chop the potato, carrot and parsnip into large pieces and put into a large oven-proof dish that has a lid. Add a squeeze of tomato puree to the pan and make up the stock cube using one of the glasses of wine and boiling water and add to the pan. Yes, I know I said two glasses, one’s for you to drink as you read a good book while you wait for the casserole to be ready! Bring the pan to a gentle simmer for 5 minutes. Season and pour the contents of the pan into the casserole dish. Put the lid on and place in the oven for about 2 hours. After two hours make the dumplings. Mix together the flour and butter with your fingers until they resemble breadcrumbs. Add the cheese and herbs and season. Gradually add a little bit of cold water and mix until it forms a dough. Form into six small balls and place on the surface of the casserole. Leave the lid off and return the dish to the oven for another 25 minutes. Serve up in large bowls that you can cuddle as you eat it.